[Upon the mount of Olives, over against the Temple.] "The east gate of the Court of the Gentiles had the metropolis Sushan painted on it. And through this gate the high priest went out to burn the red cow." And, "All the walls of that court were high, except the east wall; because of the priest, when he burnt the red cow, stood upon the top of mount Olivet, and took his aim, and looked upon the gate of the Temple, in that time when he sprinkled the blood." And, "The priest stood with his face turned westward, kills the cow with his right hand, and receives the blood with the left, but sprinkleth it with his right, and that seven times, directly towards the Holy of Holies." It is true, indeed, the Temple might be well seen from any tract of Olivet: but the word over against, if it doth not direct to this very place, yet to some place certainly in the same line: and it cannot but recall to our mind that action of the high priest. "R. Eliezer Ben Abina saith, When you see the kingdoms disturbing one another, then expect the footsteps of the Messiah. And know that this is true from hence, that so it was in the days of Abraham; for kingdoms disturbed one another, and then came redemption to Abraham." And elsewhere; "So they came against Abraham, and so they shall come with Gog and Magog." And again, "The Rabbins deliver. In the first year of that week [of years] that the Son of David is to come, shall that be fulfilled, 'I will rain upon one city, but I will not rain upon another,' Amos 4:7. The second year, the arrows of famine shall be sent forth. The third, the famine shall be grievous, and men and women and children, holy men, and men of good works, shall die. And there shall be a forgetfulness of the law among those that learn it. The fourth year, fulness, and not fulness. The fifth year, great fulness; for they shall eat and drink and rejoice, and the law shall return to its scholars. The sixth year, voices. (The Gloss is, 'A fame shall be spread, that the Son of David comes,' or, 'they shall sound with a trumpet.') The seventh year, wars; and in the going out of that seventh year the Son of David shall come." [These are the beginnings of sorrows.] Isaiah 66:7,8: Before she travailed she brought forth; before the labour of pains came she was delivered, and brought forth a male. Who hath heard such a thing? Does the earth bring forth in one day, or is a nation also brought forth at once? For Sion was in travail and brought forth her sons. I. That Christ should be born before the destruction of Jerusalem. The Jews themselves collect and acknowledge this out of this prophecy: "It is in the Great Genesis [Bereshith Rabba] a very ancient book: thus R. Samuel Bar Nachaman said, Whence prove you, that in the day when the destruction of the Temple was, Messias was born? He answered, From this that is said in the last chapter of Isaiah, 'Before she travailed she brought forth; before her bringing forth shall come, she brought forth a male child.' In the same hour that the destruction of the Temple was, Israel cried out as though she were bringing forth. And Jonathan in the Chaldee translation said, Before her trouble came she was saved; and before the pains of childbirth came upon her, Messiah was revealed." In the Chaldee it is, A king shall manifest himself. "In like manner in the same book: R. Samuel Bar Nachaman said, It happened that Elias went by the way in the day wherein the destruction of the Temple was, and he heard a certain voice crying out and saying, 'The holy Temple is destroyed.' Which when he heard, he imagined how he could destroy the world: but travelling forward he saw men ploughing and sowing, to whom he said, 'God is angry with the world and will destroy his house, and lead his children captives to the Gentiles; and do you labour for temporal victuals?' And another voice was heard, saying, 'Let them work, for the Saviour of Israel is born.' And Elias said, 'Where is he?' And the voice said, 'In Bethlehem of Judah,'" &c. These words this author speaks, and these words they speak. II. As it is not without good reason gathered, that Christ shall be born before the destruction of the city, from that clause, "Before she travailed she brought forth, before her bringing forth came [the pangs of travail], she brought forth a male child"; so also, from that clause, Is a nation brought forth at once? for Sion travailed and brought forth her children, is gathered as well, that the Gentiles were to be gathered and called to the faith before that destruction; which our Saviour most plainly teacheth, verse 10, "But the gospel must first be preached among all nations." For how the Gentiles, which should believe, are called 'the children of Sion,' and 'the children of the church of Israel,' every where in the prophets, there is no need to show, for every one knows it. In this sense is the word pangs or sorrows, in this place to be understood; and it agrees not only with the sense of the prophet alleged, but with a most common phrase and opinion in the nation concerning the sorrows of the Messiah, that is, concerning the calamities which they expected would happen at the coming of the Messiah. "Ulla saith, The Messias shall come, but I shall not see him. So also saith Rabba, Messias shall come, but I shall not see him; that is, he shall not be to be seen. Abai saith to Rabba, Why? Because of the sorrows of the Messias. It is a tradition. His disciples asked R. Eliezer, What may a man do to be delivered from the sorrows of Messias? Let him be conversant in the law and in the works of mercy." The Gloss is, "the terrors and the sorrows which shall be in his days." "He that feasts thrice on the sabbath day shall be delivered from three miseries, from the sorrows of Messiah, from the judgment of hell, and from the war of Gog and Magog." Where the Gloss is this, "'From the sorrows of Messias': for in that age, wherein the Son of David shall come, there will be an accusation of the scholars of the wise men. The word sorrows denotes such pains as women in childbirth endure." [But of that day and hour knoweth no man.] Of what day and hour? That the discourse is of the day of the destruction of Jerusalem is so evident, both by the disciples' question, and by the whole thread of Christ's discourse, that it is a wonder any should understand these words of the day and hour of the last judgment. Two things are demanded of our Saviour, verse 4: the one is, "When shall these things be, that one stone shall not be left upon another?" And the second is, "What shall be the sign of this consummation?" To the latter he answereth throughout the whole chapter hitherto: to the former in the present words. He had said, indeed, in the verse before, "Heaven and earth shall pass away," &c.; not for resolution to the question propounded (for there was no inquiry at all concerning the dissolution of heaven and earth), but for confirmation of the truth of the thing which he had related. As though he had said, "Ye ask when such an overthrow of the Temple shall happen; when it shall be, and what shall be the signs of it. I answer, These and those, and the other signs shall go before it; and these my words of the thing itself to come to pass, and of the signs going before, are firmer than heaven and earth itself. But whereas ye inquire of the precise time, that is not to be inquired after; for of that day and hour knoweth no man." We cannot but remember here, that even among the beholders of the destruction of the Temple there is a difference concerning the day of the destruction; that that day and hour was so little known before the event, that even after the event, they who saw the flames disagreed among themselves concerning the day. 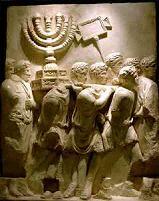 Josephus, an eyewitness, saw the burning of the Temple, and he ascribed it to the tenth day of the month Ab or Lous. For thus he; "The Temple perished the tenth day of the month Lous (or August), a day fatal to the Temple, as having been on that day consumed in flames by the king of Babylon." Rabban Jochanan Ben Zaccai saw the same conflagration; and he, together with the whole Jewish nation, ascribes it to the ninth day of that month, not the tenth; yet so that he saith, "If I had not lived in that age I had not judged it but to have happened on the tenth day." For as the Gloss upon Maimonides writes, "It was the evening when they set fire to it, and the Temple burnt until sunset the tenth day. In the Jerusalem Talmud, therefore, Rabbi and R. Joshua Ben Levi fasted the ninth and tenth days." See also the tract Bab. Taanith. [Neither the angels.] "'For the day of vengeance is in mine heart, and the year of my redeemed is come,' Isaiah 63:4. What means 'the day of vengeance is in mine heart?' R. Jochanan saith, I have revealed it to my heart, to my members I have not revealed it. R. Simeon Ben Lachish saith, I have revealed it to my heart, but to the ministering angels I have not revealed it." And Jalkut on that place thus: My heart reveals it not to my mouth; to whom should my mouth reveal it? [Nor the Son.] Neither the angels, nor the Messias. For in that sense the word Son, is to be taken in this place and elsewhere very often: as in that passage, John 5:19, "The Son," that is, the Messias, "can do nothing of himself, but what he seeth the Father do": verse 20, "The Father loveth the Messias," &c: verse 26, "He hath given to the Messias to have life in himself," &c. And that the word Son is to be rendered in this sense, appears from verse 27; "He hath given him authority to execute judgment also, because he is the Son of man." Observe that, "because he is the Son of man." I. It is one thing to understand "the Son of God" barely and abstractly for the second person in the Holy Trinity; another to understand him for the Messias, or that second person incarnate. To say that the second person in the Trinity knows not something is blasphemous; to say so of the Messias, is not so, who, nevertheless, was the same with the second person in the Trinity: for although the second person, abstractly considered according to his mere Deity, was co-equal with the Father, co-omnipotent, co-omniscient, co-eternal with him, &c.; yet Messias, who was God-man, considered as Messias, was a servant and a messenger of the Father, and received commands and authority from the Father. And those expressions, "The Son can do nothing of himself," &c. will not in the least serve the Arian's turn; if you take them in this sense, which you must necessarily do; "Messias can do nothing of himself, because he is a servant and a deputy." II. We must distinguish between the excellences and perfections of Christ, which flowed from the hypostatical union of the natures, and those which flowed from the donation and anointing of the Holy Spirit. From the hypostatical union of the natures flowed the infinite dignity of his person, his impeccability, his infinite self-sufficiency to perform the law, and to satisfy the divine justice. From the anointing of the Spirit flowed his power of miracles, his foreknowledge of things to come, and all kind of knowledge of evangelic mysteries. Those rendered him a fit and perfect Redeemer; these a fit and perfect Minister of the gospel. Now, therefore, the foreknowledge of things to come, of which the discourse here is, is to be numbered among those things which flowed from the anointing of the Holy Spirit, and from immediate revelation; not from the hypostatic union of the natures. So that those things which were revealed by Christ to his church, he had them from the revelation of the Spirit, not from that union. Nor is it any derogation or detraction from the dignity of his person, that he saith, 'He knew not that day and hour of the destruction of Jerusalem'; yea, it excellently agrees with his office and deputation, who, being the Father's servant, messenger, and minister, followed the orders of the Father, and obeyed him in all things. "The Son knoweth not," that is, it is not revealed to him from the Father to reveal to the church. Revelation 1:1, "The revelation of Jesus Christ, which God gave unto him." We omit inquiring concerning the knowledge of Christ, being now raised from death: whether, and how far, it exceeded his knowledge, while yet he conversed on earth. It is without doubt, that, being now raised from the dead, he merited all kind of revelation (see Rev 5:9, "And they sung a new song, saying, Thou art worthy to take the book, and to open the seals thereof: for thou wast slain," &c.); and that he, conversing on earth before his death, acted with the vigour of the Holy Spirit and of that unspeakable holiness which flowed from the union of the human nature with the divine, the divine nature, in the meantime, suspending its infinite activity of omnipotence. So that Christ might work miracles, and know things to come, in the same manner as the prophets also did, namely, by the Holy Ghost, but in a larger measure; and might overcome the devil not so much by the omnipotence of the divine nature, as by the infinite holiness of his person, and of his obedience. So that if you either look upon him as the minister and servant of God; or if you look upon the constitution, as I may so call it, and condition of his person, these words of his, "Of that day and hour knoweth not the Son also," carry nothing of incongruity along with them; yea, do excellently speak out his substitution as a servant, and the constitution of his person as God-man. The reason why the divine wisdom would have the time of the destruction of Jerusalem so concealed, is well known to itself; but by men, since the time of it was unsearchable, the reason certainly is not easy to be searched. We may conjecture that the time was hid, partly, lest the godly might be terrified with the sound of it, as 2 Thessalonians 2:2; partly, that the ungodly, and those that would be secure, might be taken in the snares of their own security, as Matthew 24:38. But let secret things belong to God.